Hard work is perhaps one of the most overrated factors when it comes to achieving success in life. It is true that we all need to work hard, but working hard alone is not going to work. We need more than just plain hard work. Plus, if you have no idea what you’re doing, working hard can actually be bad for your business, career, and also your life. So continue to read on and learn how you can make your hard work pays off. Last year, I have a client hired me as his long-term writer. His goal is to build a content-powered website to educate and inspire people to live a successful life. My client started strong. He hired me to write many articles and all of the articles were in the long-form format, with the majority of them were above 2,000 words. Some articles even reached 5,000 words. However, after about 3 months, he started to see that his project was not going anywhere because he did not receive the amount of traffic he wanted. At one point, he even told me that his aim was to receive as much as 500 comments for each article from his website. I dropped my jaw. He wanted to build a successful website like Neil Patel. The problem is that Neil Patel has been active in the internet marketing industry for decades. He has learned, experienced, and acquired the necessary skills to get to where he is today. And if we’re trying to copy Neil’s success and results, I will say that it is ridiculous. I’m not saying it can’t be done, but you have to have the knowledge, skills, and experience of Neil before you can produce his results. In the end, we can all guess the outcome; my client quitted and gave up on the project. This is what happens when you work hard blindly. I have seen many cases and examples, including myself, where I started strong for a project, but eventually, when I did not receive the result I desire, I quit. And this is exactly what I’m going to share with you today. I’m going to be honest with you that working hard is necessary, but sometimes, it can be bad to your business and your career, and thus, you must be extremely careful not to fall into the “blind hard work” trap. Hard work can be bad because success takes time. It takes time to lose the extra fat on your body and it takes time to build a successful internet business that generates you $10,000 a month. And because of this, hard work can be bad. First, it makes you feel like a big failure when you don’t receive the result you want after pouring in all the hard work. Let’s say that you want to lose weight and you decided that you want to exercise to burn off some fat. You can either hit the gym 2 hours each day for 3 months continuously, or you can hit the gym 24 hours once. Which will you choose? Every sane person will know that success takes time and hitting the gym 2 hours a day for the next 3 months sound more achievable than working out in the gym for 24 hours straight. The problem is that most people want an immediate result. They thought that as long as they put in massive action, they will see the result. And guess what, they forget about the importance of being consistent. I’m here to tell you that success requires time and consistency, not some massive or one-time action. 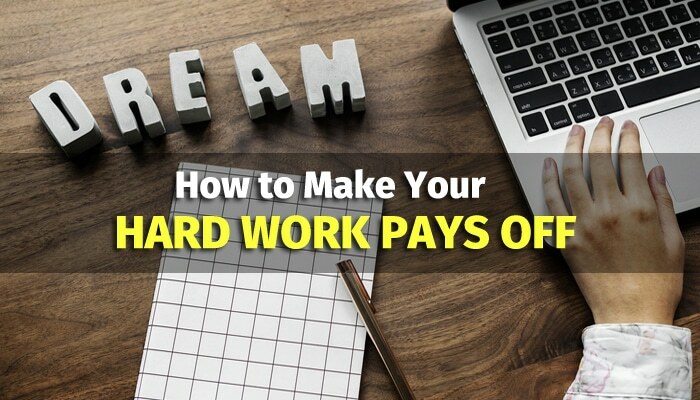 I have seen a lot of people fall into this trap by thinking that they can achieve tremendous success in a short time if they put in the hard work. The client I explained above falls into this trap. If you want to build a successful blog, do expect to spend at least a year or two into growing it before you expect to see any significant result. Jeff Goins, the successful blogger and best-selling author spent about 2 years into blogging before he reached the tipping point and become an authority in his niche. Joel Brown, the man behind Addicted2Success says that he published more than 300 posts on his blog before the blog receives significant traffic and results. The pattern is clear. Success takes time. And if you think that you can build a million-dollar website within a few short months from scratch, highly likely, you’re going to fail. My friend, Rome was not built in a day. A big and tall building takes a lot of planning and many months are spent building its foundation. If the foundation of the building is not strong, it will collapse. Please understand that. Second, you may get burnout because you’re trying to accomplish too much all at the same time. Success is a marathon and not a sprint. Many understand this, but still, they choose to do differently. They want to get to their destination as quickly as possible, and so they sprint as fast as possible with all their energy. Only then they discover that they have used up all their energy and they are still far from their destination. It is just planting a tree. No matter how much water you or fertilizer you put into the soil, you can’t force the tree to grow. The tree will grow at its own pace and you can’t force it. All you can do is to ensure it gets enough sunlight, water, and the soil is fertile enough for it grows. And if you over-water the tree, you will kill it. The same goes for your goals and the things you want to achieve in life. You just have to make sure that you are making some progress each day. If you try to force it, you may suffer burnout. Like going to the gym, you just need to make sure you workout each day, an hour or two. Even for just 30 minutes a day, if you workout consistently for 3 months, you can still see the result. However, if you try to force it, like a workout for 10 hours straight, you may experience burnout. The next day, you will not want to get to the gym anymore. We are not machines, we will feel tired and exhausted when trying to do too much. Wait, even machines need maintenance from time to time too, right? My friend, you must make sure that your actions are sustainable so that you are able to carry out your plan for the long-term. First, you understand that success takes time, and thus, it is going to be a marathon and not a sprint. And because of this, we have to make our progress a long-term effort. Hence, there is no need to rush things. You don’t have to spend 20 hours working on your goals, but you do need to make it sustainable. You don’t want to get burnout, which eventually makes you exhausted and wanted to quit. Third, if you’re working on the wrong thing, no matter how much effort or hard work you put in, you are never going to achieve the results you want. In the article, I mentioned that if you want to work hard, you must fulfill 5 principles, and one of them is to work on the right plan. If you are working on the wrong plan, you will produce the wrong result, no matter how hard you work. Just like if you want to see the sunrise, there is no point to keep running to the West. This is why before you want to work hard, you must make sure your plan is at least viable and able to get you the result you want. Imagine if you want to build a successful blog and make some passive income from it. A lot of people have the idea that building a successful blog requires a nice theme and a great logo. Thus, they spend hours and hours into tweaking their themes and looking for people to create them a logo. Not just that, they understand that keeping themselves updated is another important key to success as a blogger, hence, they read a lot of other blog posts and also watch tons of YouTube videos. Plus, when it comes to marketing their blog, all they do is spend time on social media. They set up their fan page on Facebook, they create a Twitter account, Pinterest, LinkedIn, etc, and then they spend even more hours learning how to drive traffic to their social networks. Guess what, they have a clear goal, but their plans or their strategies are not effective enough. They forgot that the most important key to growing a successful blog is content. In the beginning, you should spend most of your time on building quality content that people want to read. It is the #1 reason why people come to your blog. There’s no point to design a great theme or a beautiful logo when there is no one visiting your blog. This is why hard work plus smart work is important. You don’t want to just work hard, but you want to work smart too. The problem with most people is that they choose only either one of them. They either work hard, or they work smart. Now, you can choose both. If you want to greatly increase your rate of success and produce the result you desire at a faster pace, go for both. So work hard and work smart too, my friend. If you want to work hard, sure, go for it, but just make sure that you understand what you’re doing. Don’t jump in straight and work hard blindly. I have seen people who work extremely hard their entire lives, but still, they are not making much by the end of the day. I have seen people who work from early morning until late night. They started as early as 8AM, they work hard throughout the day and by the time when they get home, it is already 9PM. And they have to repeat the same cycle again the next day. After 20 to 30 years later, they are still doing the same old thing, working hard, but they are not getting anywhere. No improvement, no positive changes. Worse when the economy turns bad or the competition becomes stiff. It clearly shows that working hard isn’t something that will guarantee your success. You need more than just hard work to achieve remarkable success in life. Now that you understand why working hard alone is not going to work out for the long-term. Like I said, I’m not against hard work. In fact, I do believe in working hard. The problem is that you need to work hard on the right thing. Without following a proven plan and working hard blindly will lead you off the road. My friend, if you are serious about working hard to achieve the success you want, congratulations. However, make sure you follow some of the pointers below before you start your journey. These pointers are going to be helpful because they can make sure that your hard work pays off. First, you need a crystal clear direction of where you’re going. You need to find out your purpose and what you want to do in life. Knowing exactly what you want to do in life gives you a crystal clear direction so that your mind can come up with strategies to achieve it. Like I said, you don’t want to work hard blindly toward everything, instead, you want to focus your energy and effort to get there. There are many things you can achieve in life, from your health, wealth, to your relationships, but if you are directionless, you will become responsive and being directed by your circumstances rather than being in control. The first step to achieving remarkable success in life is to find out what you want out of your life. When you understand what you want, only then you can make conscious action to get there. Second, you must have a plan and understand how to get what you want. The easiest way to find out the answer is to learn or model other successful people. Now, if you want to get to the top of the mountain, all you need to do is to follow the trail. Someone who has successfully been to the top has already left the trail for you to follow, and all you need to do is to follow the trail. Of course, you can venture out on your own, but when you do, do expect to end up in dead ends and it is going to be tougher. In today’s world, you can learn just about anything. If you want to learn to play the violin, you can watch a YouTube video how to do it. But first, you have to look for a violin for sale and purchase the one that best fits you. You must also have the right motivation and dedication in practicing every day until you find yourself an expert in it. If you want to lose weight, you can buy a book and follow the diet and exercise plan. And if you want to learn how to make money online, you can certainly learn to do so by learning from those who have done it before. It is always better to have someone guide you along the journey. This is why professional athletes have coaches and successful entrepreneurs have mentors. You need help from others. You need to learn the way and shortcut your learning curve. If you try to figure things out by your own, it will take much longer, plus, you need to have a lot of determination because you’re going to fail more times than when you follow a proven plan. For me, I learn a lot about success from John Assaraf, especially his Having It All program. He talks a lot about adopting the right mindset because when your mindset changes, your decisions and actions will change. And when your action changes, your results will change too. And I believe that John is right. Success starts with the mind. This is why his Having It All program has been so successful and is one of the best online personal development courses in the world. My friend, now that you understand the importance of a proven path, you don’t have to hit the wall by trying to figure things out on your own. The path has been laid for you. What you need to do next, is to take action. Not just any action, but consistent action. Most people are excited when they first started. They feel so motivated and are absolutely passionate about their goals. However, as they go through the day and put in all the hard work and when they don’t receive the results they want, they slowly lose their interest and passion in their goals. Eventually, they stop taking action and then give up and quit. They jump into another opportunity and repeat the same cycle. This is why hard work may not be ideal when you are chasing for long-term success. Instead, choose to work consistently. Of course, you may have heard stories of how people take massive action in a short period of time and manage to produce the success that they desire. It is true that massive action is good, but in my opinion, consistent action is the one that truly counts. You don’t want to work hard for a week and then stop. You want to be consistent. You want to make your action SUSTAINABLE. People who are successful are those who take consistent action, day in and day out, even when they don’t feel like it, they still choose to do it. On the other hand, people who start strong but eventually lose their steam and slow down are usually the ones that give up and quit in the end. You can work hard, but more importantly, make sure you are being consistent. If you want to be a blogger, it is better to write 1,000 or 2,000 words a day and then publish consistently each week than to come up with a 10,000 words article and then choose to only publish once a month or every two months. This is also why success is difficult and hard. Because it requires consistent work and not just plain hard work upfront. Like I said, success is a marathon, not a sprint. So stop sprinting because it is not the best strategy. Instead, choose to slow down and be consistent. Another important key to making sure your hard work pays off is to review and improve your plan. This is why planning and having a crystal clear goal are important. When you know exactly what you want, you create a plan to achieve it, and you take action, after some time down the road, you can tell if what you do is getting you closer or further away from your goals. You must study and keep making adjustments to your plan. You must improve from time to time so that you can be more effective and produce better results each time. This is why you have to review your work. Some people do it once a week, some people do it monthly, while some do it quarterly, and some choose to review their goals and progress annually. In my opinion, for personal goals and achievement, the best is to review your progress either weekly or monthly. When you review your progress and the results you are getting, you can tell right away if what you did work out or not. You don’t want the hard work that you have poured in go down the drain, thus, review your work on a regular basis. And in case if you are not producing the results you want, change your strategy. Improve your plan. Treat your failures and mistakes as lessons. If you do it this way, you can only improve and get better. And success will be guaranteed. So learn from your mistakes and failures. Turn them into lessons that catapult you to higher ground. Another important key factor that helps is to always celebrate your progress. Ever wonder why people lose interest in their goals? Well, one of the reasons is that they don’t celebrate their wins. When I first started this blog and received some visitors to it, I’m absolutely thrilled. I’m so happy and I’m feeling motivated and keep telling myself that I can do it. As the time went by, this blog receives hundreds of visitors each day, but I’m not feeling as thrilled as before. I guess this is what happens to most people out there. When they first set their goals, take action, and see some results, they are thrilled. However, this feeling did not last. It becomes a norm and people start expecting it to be this way. Eventually, they don’t celebrate their wins anymore. They think that it is normal to have tens or hundreds or even thousands of visitors a day. In the end, they lose the zest and they become less passionate about their goals. It happens to all of us, in every area of our lives. When a couple starts a relationship, they are absolutely passionate, but after some time, the passion faded. When someone first signs up for a gym class, they feel extremely motivated to workout and they even buy themselves a new Nike shoe. However, after 3 months down the road, the motivation fades and they don’t get to the gym as often as when they started. This is why we must celebrate our progress. Celebrate our wins, no matter how small they are. I keep telling myself that as long as I’m making progress, I should feel happy and accomplished. Every time I hit the published post, I’m feeling good. And each day after I have written an article, I give myself a pat on the back and feel proud that I have done what I set out to. Of course, some articles that I wrote are good, some are great, and some are lousy. But as long as I’m making progress and putting in the hard and consistent work, I should celebrate. You should do the same. Regardless of how big or small your progress, as long as you are putting in the effort, you should celebrate and be proud of yourself. Never let it becomes a norm. When what you do become typical, you will quickly lose the feeling of excitement. Instead, be a beginner and feel the excitement. Remember, you have put in the hard work, so just make it pays. You now understand why working hard can be bad for your business, your career, and also your life. When you work hard blindly without truly understanding what you’re doing, you’re setting yourself up to fail. My friend, do understand that success and most remarkable results require time to produce. Bill Gates did not form and build Microsoft into a billion-dollar company in a day. Warren Buffett did not earn the billionaire investor title in a month too. Every big success requires time to produce. And if you are on your way to building your own success, have the patience because it is not going to come to you so soon. Therefore, be consistent in what you do. Stick to your plan and keep on reviewing your progress. Make adjustments where needed and eventually, you will arrive. The journey may be long, but as long as you don’t give up, you will get there. Find out where to work hard on and have absolute clarity with what you want in life. Follow the proven path and model the success of others to shortcut your learning curve. Take consistent action, day-in, and day-out. Review and improve your plan regularly and learn from your mistakes and failures. Celebrate your progress and be proud of yourself that you have poured in the hard work. Let me know what you think of this article. Do you think that hard work is necessary? More importantly, do you agree with the ideas in this article? Let me hear your opinion in the comment section below.